Wordsmithing Pantagruel: Pork Secreto for sale at The Meat Hook! UPDATE: 20120419 I did some more sleuthing and put up a post with some more details about the location of the secreto cut on the pig. At long last, my years long quest may be nearing its end. The Meat Hook (here's its blog) in Brooklyn has started selling the secreto [UPDATE 4/2012, just realized that last link was broken, now fixed], the mysterious cut of pork I had only encountered in Portugal and Spain, way back in 2007. 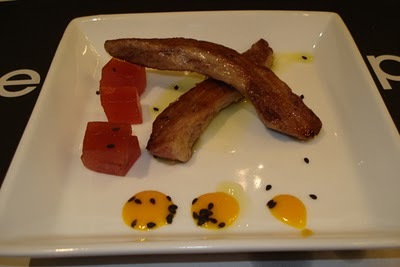 What I specifically tried was secreto Ibérico, from the famed black footed pigs, and we had it several times over the course of the trip, and each time was fantastic. It is a highly marbled cut of pork, but not too fatty; the veins of fat are small and well incorporated into the meat, in a similar fashion to kobe beef and not large streaks of fat like a typical belly. You simply grill it quickly over very high heat, and the surface gets crispy while the interior fat melts and leaves the meat moist and bursting with flavor. It also retains the texture of a nice steak. I returned from the trip determined to find if there was something equivalent I could get here, but I was utterly stymied. Even when overseas, I asked every time to get an explanation of where on the pig the cut came from, but between the language barrier and my host's uncertainty, I never got far. I figured I could always ask google, and even he was stumped. I found a handful of pages in Spanish which google translated but left me still confused, and there were some blogs (some with with pictures) proclaiming how great the stuff is (here, here, here, here, here, and here). There were a couple discussion boards with some info but mostly leaving me in a wash of other terms for Spanish cuts. I even found a site that had a diagram with the cut labeled, but it was cartoony and didn't help. I asked a Portuguese waiter I had at an excellent meal at Cru one rainy evening when most every reservation had canceled and Chef Shea Gallante was really showing off for us. I asked anyone and everyone who I thought might know, but I was still at a loss for useful info. I asked the butcher Tom Mylan at one of his early pig butchering classes in the back of the Brooklyn Kitchen store in 2008. We didn’t think that pork belly could get much better, but leave it to the Spanish to prove us wrong—turns out they’ve been hiding the best part of the pig for years. Fortunately for us Yanks, Tom Mylan, of artisanal Brooklyn butcher The Meat Hook (100 Frost St between Manhattan and Meeker Aves, Williamsburg, Brooklyn; 718-349-5033), has done some sleuthing abroad and returned with a little-known porcine gem: The secreto—literally “secret” in Spanish—is a tender strip of pork hidden beneath a thick layer of belly fat...In Spain and Portugal, where he first tasted the cut, butchers traditionally carve out the meat and save it for themselves, eating it seared with garlic and herbs. Miracle of miracles! I can almost taste it. I have not gotten a chance to get over there to get some yet, but I intend to soon. As luck would have it, Mylan was serving some tasty bacon sausage at the Bid Against Hunger event I attended on Tuesday so I mentioned the secreto and how I had asked him about it years ago, fulling expecting that he had no recollection and his new find was a coincidence, but it turns out he did remember and my query it was what got him on the trail at first. Like, me, he first tasted it in Portugal, but he was able to figure it out. And then bring it to me. Sweet. Oh, by the way, you can now get the real thing, Iberico Secreto, at Seamus Mullen's new place Tertulia. Or at least you can when they have it as a chalkboard special. Comes with an iberico rib as well. Just had Secreto from Iberico Pork at Carelia restaurant in downtown Helsinki. It was incredible and the owner couldn't fully explain what it was so I went to Google and found your site. Thanks. Under belly fat??? I have the dish twice and both times it was explained to me as the meat from under the shoulder blade. I have even saw the raw piece of meat and it is looked like the size and shape of a medium sized pig's shoulder blade. I have the fortune of knowing the owners of Curate' Tapas Bar in Asheville, NC and we had dinner there last weekend. Felix told us about the secreto and we had to try it. Katie (Executive Chef) brought it out to us and explained that it is the cut directly under the shoulder blade next to the ribs. Holy Pig! it was amazing. It had a kobe beef texture with an incredible rich porky flavor. Can't wait to have it again. I think both behind or under the shoulder blade AND under the pork belly might be roughly accurate descriptions of the hard to describe location. I’m surely coming again to read these articles and blogs. You are providing your readers with some great stuff to read!